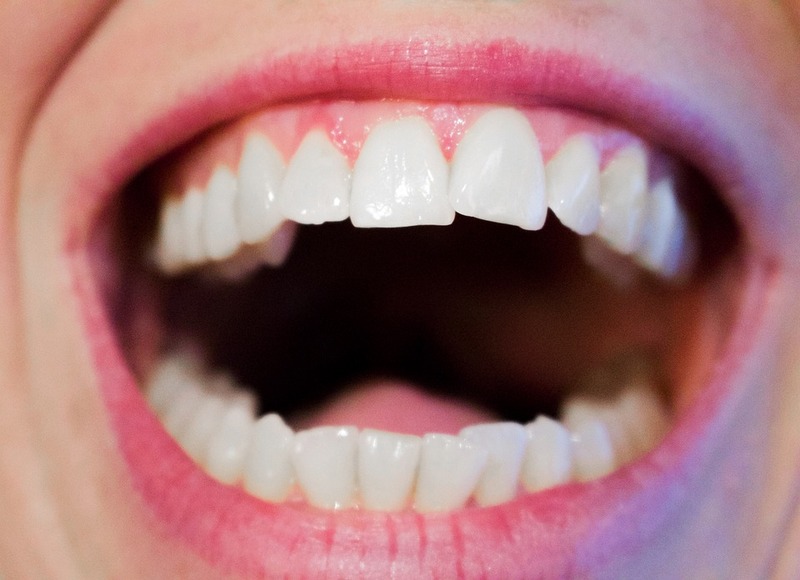 SearchResearch Challenge (10/31/18): Is this a safe treatment for caries? As you know, new therapies come onto the market every so often. Those therapies have risks and benefits. How do you evaluate these things? What do you do to actually do the research you need to evaluate these things? Consider this one: SDF (Silver Diamine Fluoride) treatment is a way to treat teeth with a simple coating that not only prevents future cavities (caries), but also seems able to reverse the damage in some existing cavities. Ideally, we--the SearchResearchers of the world--would be able to do some kind of sanity check before taking on a new treatment regime. 1. How would you go about determining if SDF is right for you, your family, or your child? What would you do to research this? 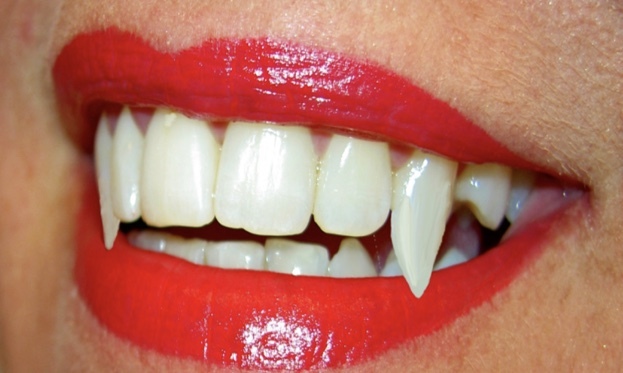 Would you get SDF? Of course I'm interested in what YOU think about SDF, but just as importantly, HOW did you come to this determination? What steps did you take? What sources you think are credible, and why? Please leave notes about your process in the comments below. I'm looking for some great thoughts here. Let us all learn how you would do this! Answer: How can I find lists of things? A list of items is a useful thing to have. When you're learning something new, having a list of examples of that thing gives you something to learn from. It's a natural way to try and get your mind around a given topic. We do this all the time. This week's Challenge is intended to show you how to quickly get a list of a category. 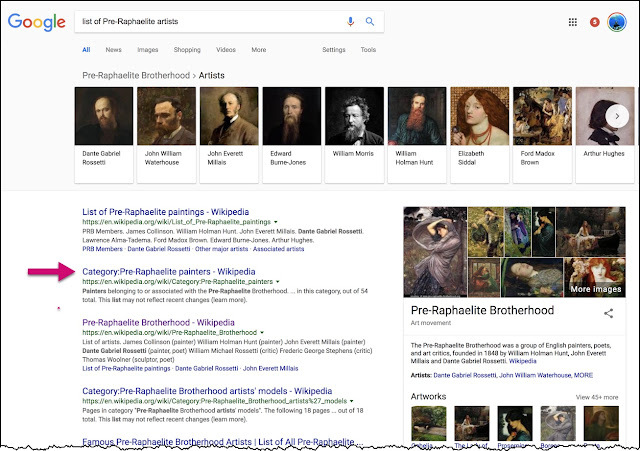 As I mentioned, I wanted a list of Pre-Raphaelite artists, and was able to get Google to give me this list. Notice the link I highlighted with the red arrow? 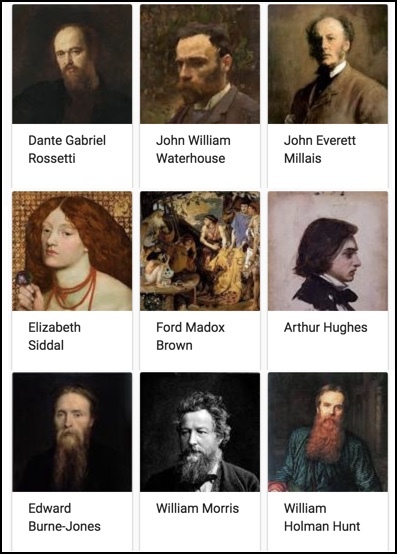 That's a link to the Category page on this topic for "Pre-Raphaelite painters." That's the Wiki version of the "list of all X" for that category. As with the other SERPs, notice that there are a few "People Also Ask" questions that can be useful for your research. HOWEVER.. You might have been thinking of works published in the Regency era (that is, between 1811 and 1822, like Pride and Prejudice) and not a more recent novel like Arabella (published in 1949). 1. Classic Regency fiction written between 1811 and 1822. The works of Jane Austen, Sir Walter Scott, Susan Ferrier, and Maria Edgeworth were all written during this time period. 2. 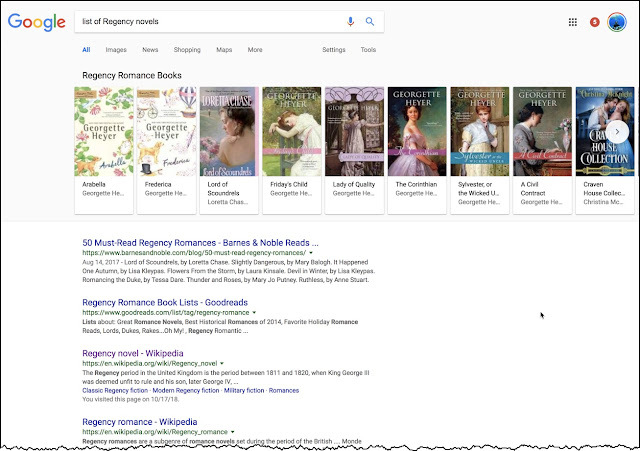 Modern Regency fiction, that is, fiction set within the Regency era. These are primarily romance novels (called "Regency romances"), historical fiction set in that period, detective fiction, and military fiction. gives a more satisfying result. 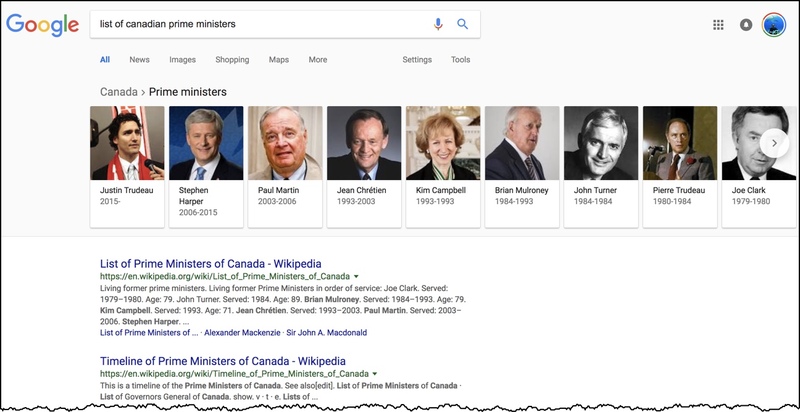 In this case, I'd like to see a full list of the PMs along with their terms in office, just to check for completeness. Although in second place would have to be the Wikipedia List of Lists of Lists! 2. 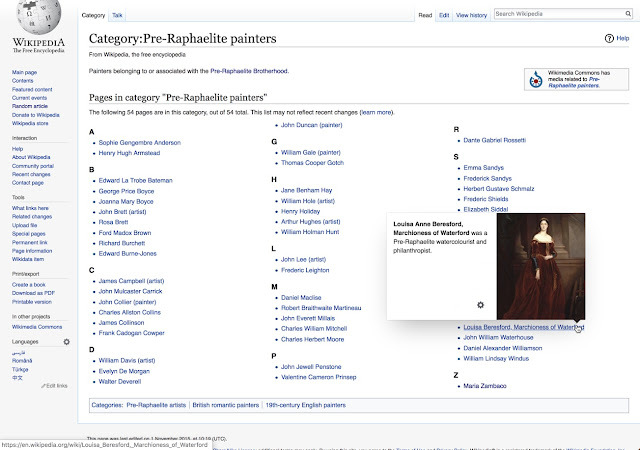 Remember the Category: pages of Wikipedia. They're often not fought over very much, so they're a bit less likely to have vandalism... and there are Category: pages of things you might never have thought about. They're worth a look. 3. 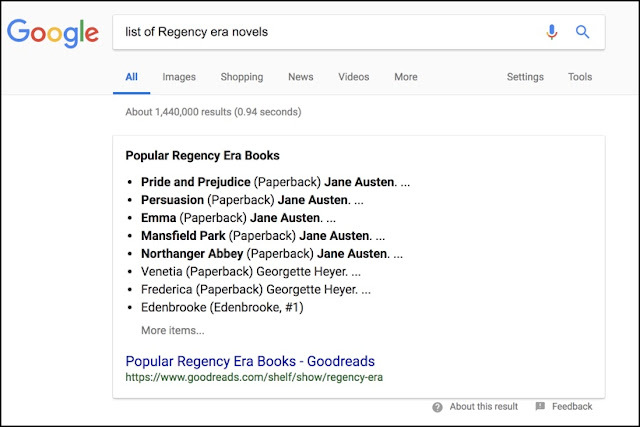 The query [ list of ... ] is a handy construct to use when you're just beginning to learn about something. ... aka the Baader-Meinhof effect, happens when you learn something new, and then suddenly start to see it everywhere. This happens when you finally decide to buy a new car and after weeks of agonizing, you finally pick that very special one, the very distinctive car that speaks to only you. You're so happy. And then you start to see that car everywhere. It's not distinctive at all, but actually pretty common. That's the Baader-Meinhof effect. It happens because you don't notice all of the cars that are just like it before you made the choice--it's an illusion of the frequency of the item. It also happens with words. If I use the term whale shark and you learn that as a new concept, suddenly you'll see it everywhere. Trust me, you'll start to see whale shark everywhere now. So when Regular Reader Ramón wrote it with a Washington Post article, it was a nice example of this effect. He found a real, live example of our Challenge from last week: How can I make a movie of my flight? In that post, I show you how to make a video by using Google Earth to capture a flight path. Thanks for the find, Ramón! Now we all know how this brilliant piece of visualization was created. 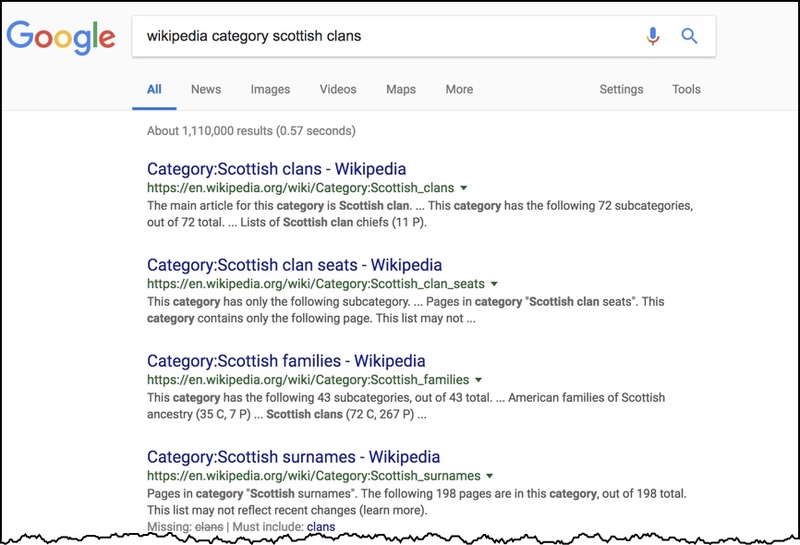 SearchResearch Challenge (10/18/18): How can you find lists of things? ... for a list of things. It's a natural way to try and get your mind around a given topic--if I can give you a list of items in that category, you'll get a sense of how that category of thing is defined (or at least how it looks). People often do this when it's hard to define something precisely. The difference between a vegetable and a fruit is tricky, but if I tell you that apples, strawberries, bananas, and grapes are all fruits while potatoes, carrots, corn, and peas are all vegetables, you'll start to get the idea. This doesn't give you a technical definition (difficult question: is a cucumber a fruit or a vegetable? ), but it gives you a working intuition. Once you figure out how to do this, you'll be able to this, and much more! As always, be sure to tell us how you do it. AND... if you find a particularly interesting set of things, be sure to leave a comment telling us about the great set you found (and what it is!). Answer: How can I make a movie of my flight? ... I just wanted a movie that's a scan of the flight path. Why? Because as I was looking out the window, I saw beautiful things, extraordinary things, and I wanted to be able to stop the plane and look around a bit. How could I do that? 1. 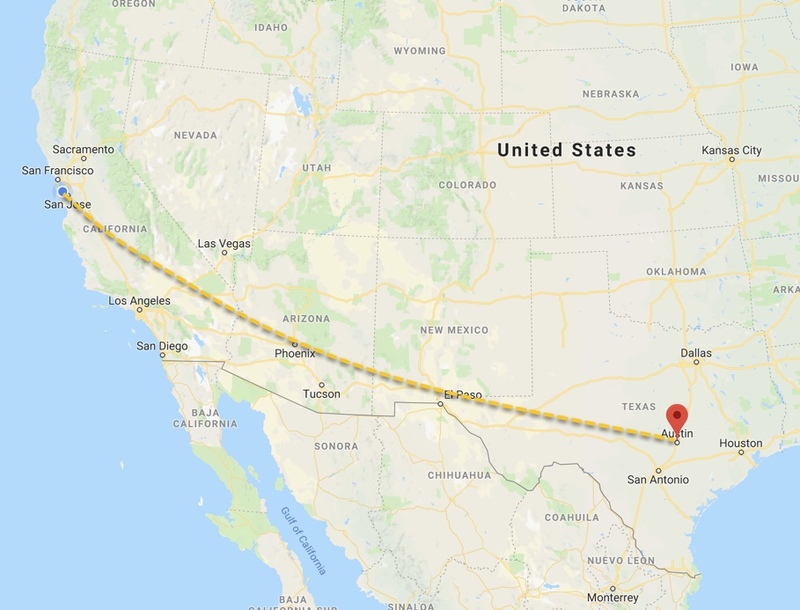 Can you make a movie that recreates the experience of flying from San Francisco to Austin? Obviously, you don't want it to take all 4 hours. How about a 2 minute version of the flight that just shows off the really interesting parts between Arizona and West Texas? 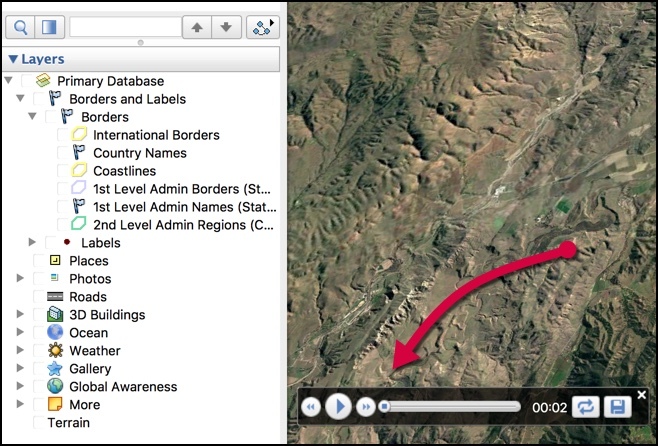 Just looking at this suggests that I can make a video like this with Google Earth Pro. Great! In the image below, I created a path, and added to yellow push pins (just to make the start/stop locations more visible). This is the flight path. Once you've got that, you can click on the floppy disk icon (far right in above diagram--no, I don't know why they show a floppy disk icon as the "Save" button). 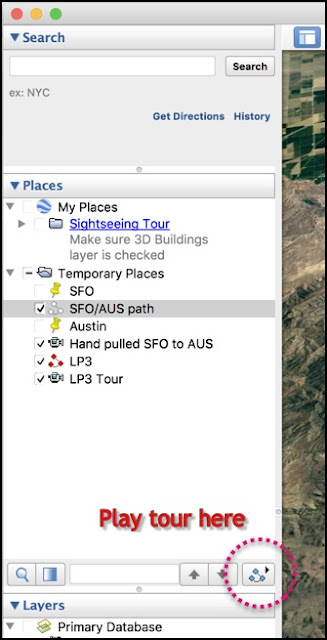 That will create a new item in the list in the upper left--here I named it "SFO/AUS Tour." 3. Now... Open the Movie Maker tool. It's in the menu pulldown list Tools>Movie Maker. Note: You need to close the Play Tour controller first! This will make the tour playback automatically and will create a video as a side-effect. There are lots of options you can do to make it fly in the way you want. 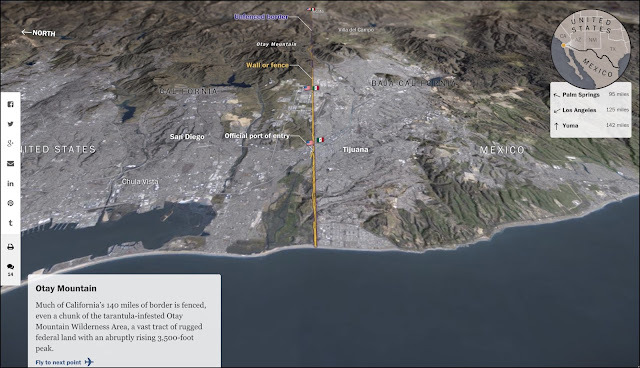 In particular, you could move the view position manually to fly over the entire route quickly. Here's what that video would look like. It's kind of jerky because I'm actually pulling the viewpoint along moment to moment, and I wasn't super careful. My original goal, remember, was to be able to fly along the flight path and stop wherever I wanted. As wonderful as YouTube is, the UI for YouTube isn't the best way to inspect the terrain as you fly overhead. For that, you want a downloadable MP4 file that you can open with a video controller (like Quicktime Player). Here's the link to that video. Try right-clicking the link to download it, open in your favorite video controller, and then try zipping back and forth like a boss--you can easily pause, go forward, go backward. It's a very different experience than YouTube (or any online video system) can do. Direct manipulation is really handy sometimes. This is one of those times. Finding the right tool is often a prerequisite to satisfying your search goals. 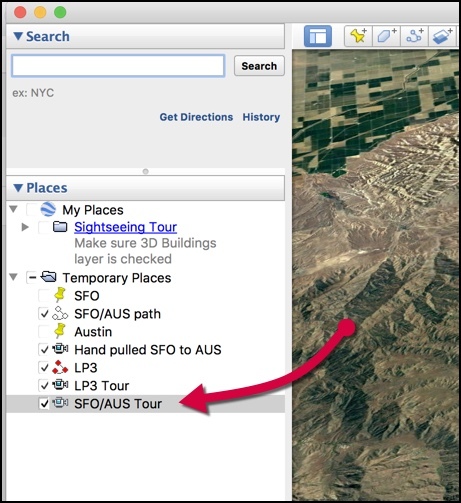 In this case, we had to find the right tool, and a simple search found that Google Earth could do this. 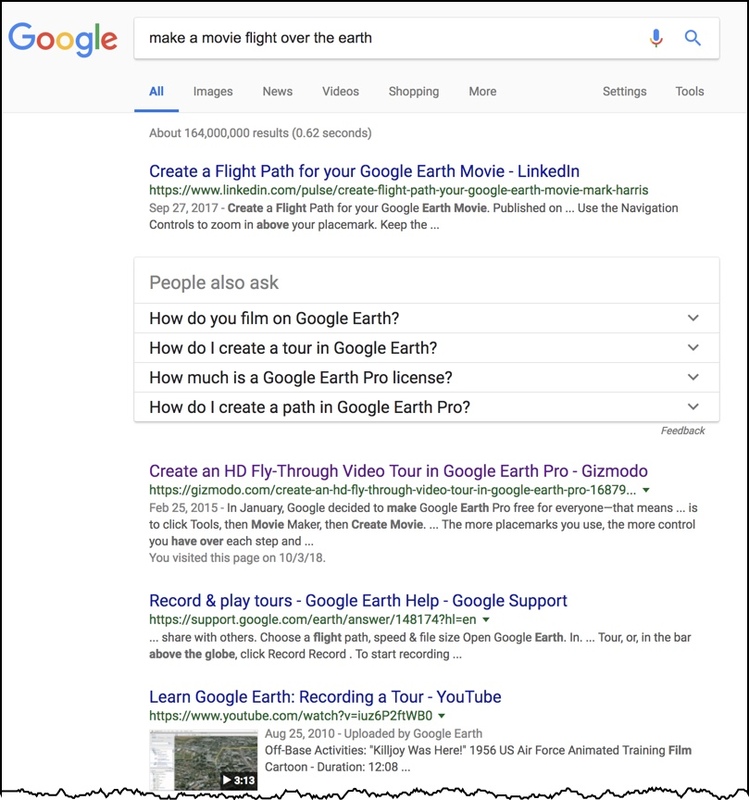 After figuring that out (and downloading Google Earth Pro), it was a process of figuring out how to actually make a movie that would follow the flight path of the plane. THAT involved a bit of futzing around, but once I figured out the sequence of button clicks, it was straight forward. And now I have my video... on my computer, ready to zip back and forth along the flight path. 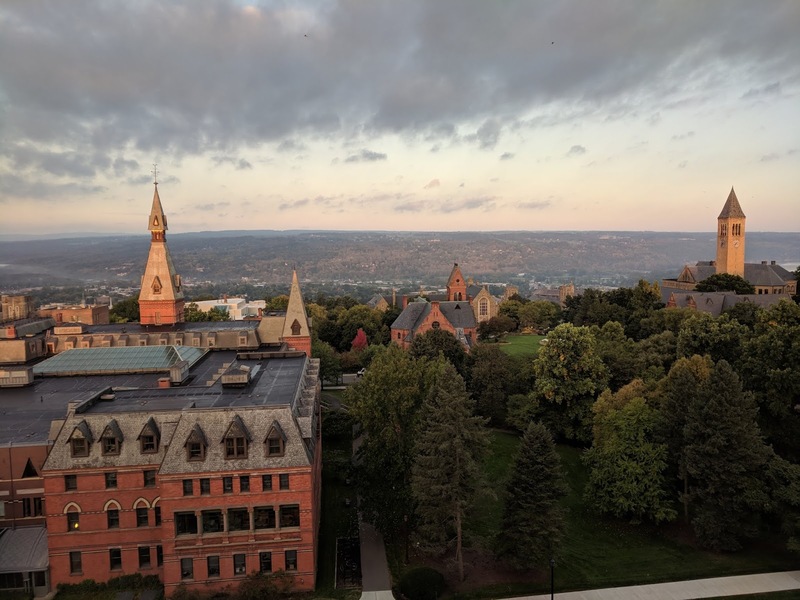 ... because the answer to last week's Challenge is fun.. but I'm doing a tour of upstate New York this week. I'm teaching at Cornell today and the University of Rochester tomorrow. As a side-effect, I've had no time to write up my answer to the "Can you make a video?" Challenge. BUT... I'll have time this weekend, so I'll post my solution next Monday, October 15. Keep searching (and making those videos) until then! In the meantime, I'll be teaching (and occasionally looking for the color changes in the fall leaves... which I have to admit, seem rather muted this season). ... that deserves practice. And by practice, I mean that you very deliberately look at your mistakes and learn from them. In an earlier post about Fermi Estimation, I showed how I estimated Enrico Fermi's height by this method. Here's an infographic showing what I did. HOWEVER... As good as estimation is, it's worth checking your work from time to time in order to learn where you can be better. As Jon said in an earlier post, the average size Italian was 5 feet 6, but I would say he is below average height. My estimates would make him between 5 and 5"3"
Using this image and assuming an bench height of about 30 inches, this would make him only 60 inches tall (5 feet). 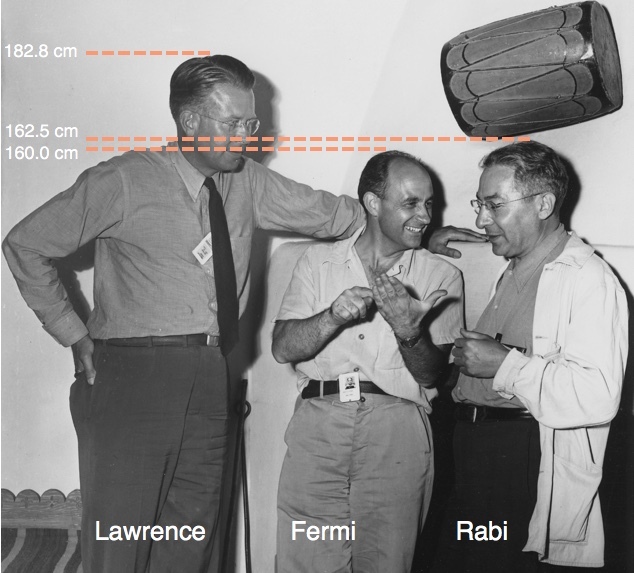 Using this image with Robert Oppenheimer (on the left) I estimate him [Fermi] at about 5'2". According to the NY Times Obituary, Oppenheimer was 6 ft... 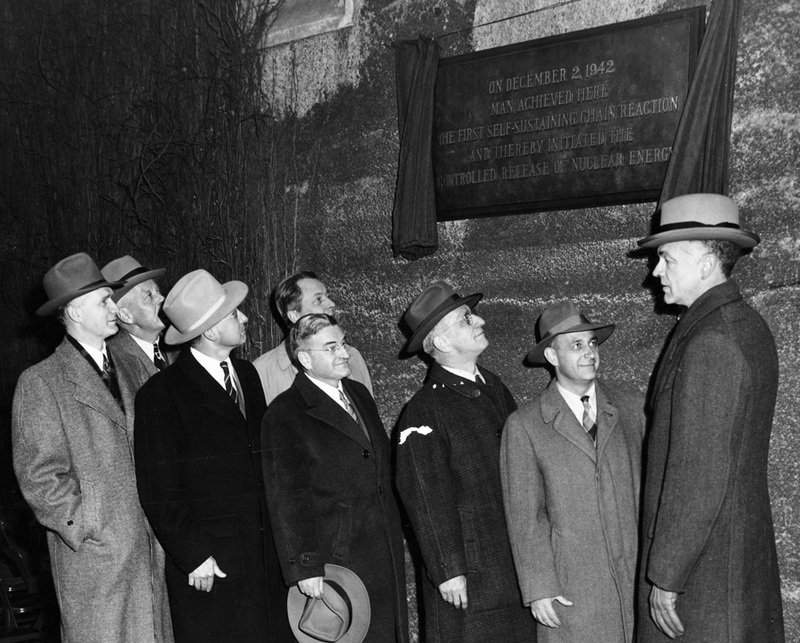 Likewise in this photo he [Fermi] is a good foot shorter than Chancellor Hutchins (right) who was 6'3" according to Commentary Magazine. 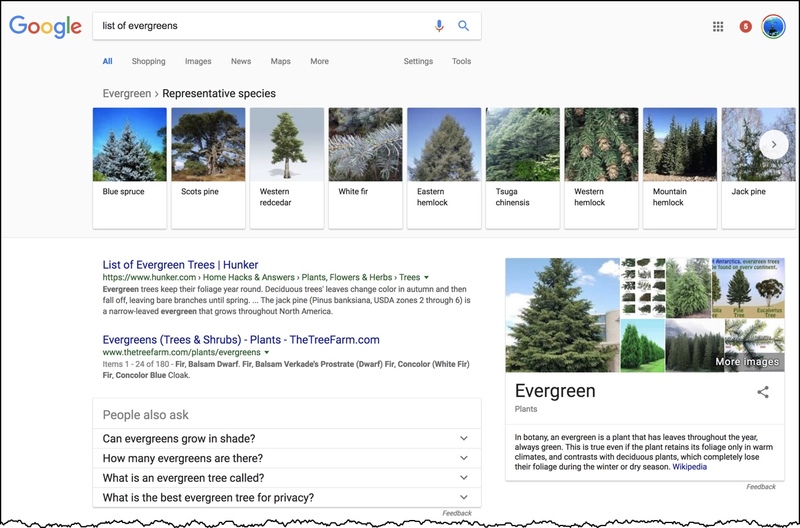 Aside from being a GREAT example of using photos to estimate height (rule of thumb: use more than one photo to verify; also get the heights of other items in the photos), this also bring up another valuable estimation heuristic: Always double check your work. What went wrong in my original post? That's easy to spot: My original estimate of his head size was 9.4 inches (21.9 cm). Where did THAT number come from ? From two sources: (1) my estimate of his head size by comparison with the control panel behind him. I know the size of those control knobs, and I estimated from that. (2) I measured my own head size. Since the two numbers were close, I went with that number. Thing is, I'm taller than Oppenheimer and a bit shorter than Hutchins. So it's not a surprise that my head measurement would produce a fairly tall estimate. Chris showed us a great estimation validation method--Look at the person side-by-side with known people (and known heights). Here's another picture showing three famous physicists: E. O. Lawrence, Enrico Fermi, and Isidor Isaac Rabi standing side-by-side. A quick search for Lawrence shows his height at 6 feet (182.8 cm). A quick search for Rabi shows his height at 5' 4" (162.5 cm) So this estimate by photograph is probably pretty accurate. Fermi was a bit shorter than his friends, right around 5' 3" or so. 1. If you take an initial estimate and multiply it by 7.5, then any error you have in your initial guess is going to be magnified by 7.5! Caution: Make sure your initial data is pretty close before you go multiplying it by a fairly large facto. 2. It's always good to have two very different ways of estimating. In this case, a quick photo check would have shown that my original estimate was off. I'll do that next time for sure! SearchResearch Challenge (10/3/18): How can I make a movie of my flight? ... as usual, I had a window seat to I could see the landscape slowly rolling past the window. In my opinion, this is one of the most wonderful things you can do: look out the window at the glorious southwestern geology. At some point in my flight, I saw many extraordinary things... forests, craters, mountains, brilliant white salt flats, and center-pivot irrigation systems that defined small communities in the middle of a vast loneliness. What I really wanted to do was to make a film that would capture all of the beauty of the country we were passing over. Alas, I didn't think to tape my video camera to the outside of the plane.. and have it run for the 4 hour flight. 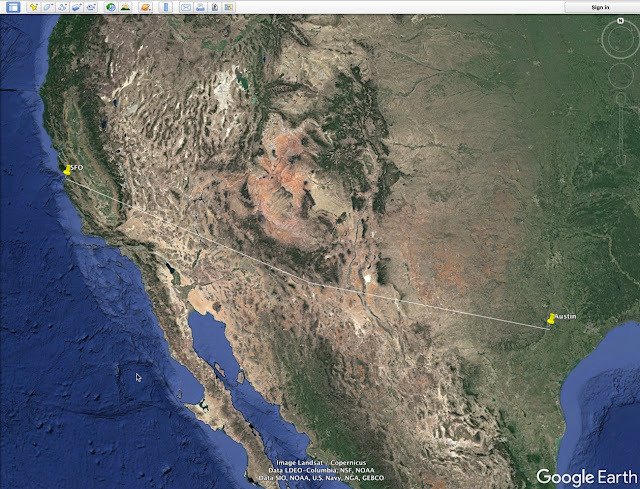 Here's the path we took from San Francisco, over Phoenix, over El Paso and over West Texas into Austin. Be sure to tell us how you did it (and what searches you had to do). AND, if you would, please post your video to YouTube so we can all see what you made. Of course, once you've made the video, be sure to tell us what interesting and wonderful things you found along the way. Here's one of the things I found--a huge patch of white sand (naturally enough, this is White Sands National Monument). It's a big white sandy beach in the southern part of New Mexico. It's really obvious--once you see it and learn where it is, you won't be able to NOT spot it on any aerial photo of New Mexico. After this, you'll literally see the world differently.